Global E-Commerce is reshaping the world of delivery. Cooper Smith of Business Insider (pictured above), Brody Buhler of Acenture (pictured above), Matt Swain of InfoTrends (pictured above) and Gary Reblin of the USPS (pictured above) discuss disruption in the industry. Postal Consulting Services President, Kathy Siviter, reviews PostalVision 2020/5.0 as part four in a nine part series. Brody Buhler, senior executive at Accenture, told attendees of last week’s PostalVision 2020 conference that “Big Bang Disruption,” is a much more dynamic and aggressive disruption than marketplace disruptions in the past. Accenture’s Institute for High Performance originated the Big Bang disruption concept, which is a disruption that competes on all three traditional customer strategy fronts – personalization, price and innovation. 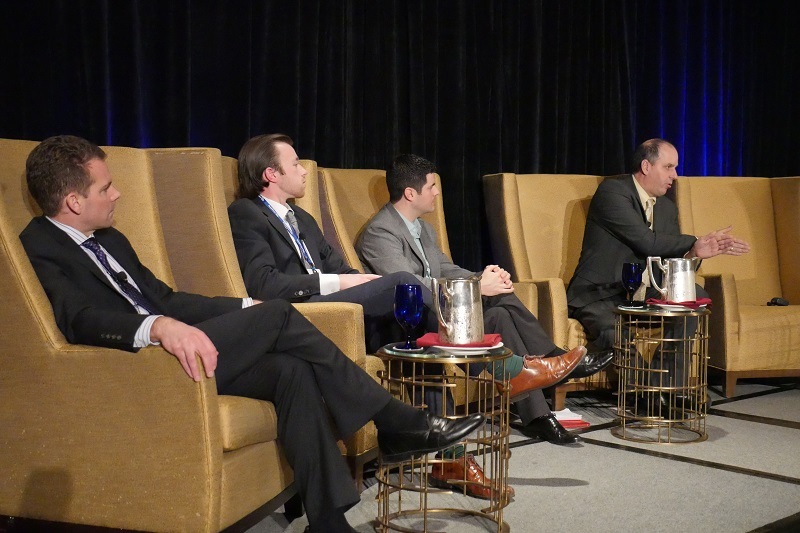 Buhler facilitated a panel discussion on drivers of global ecommerce logistics and the Big Bang disruption theory with shipping experts Shea Felix, Endicia; Cooper Smith, Business Insider; Matt Swain, InfoTrends; and Gary Reblin, USPS Vice President of New Products and Innovation. Buhler said that under the Big Bang Disruption theory, every 18 months capabilities will get twice as good at the same price point. Three technologies that have come together have radically changed the consumer landscape forever, he said – the smart phone, network and cloud – providing infinite processing capability in the hands of nearly everyone on the planet. It’s hard to imagine what will be twice as disruptive 18 months from now, he said. In the logistics market, retail trends are changing with more local shipping forays, Buhler said, which are likely to increase with Amazon now able to establish presence in states and not being subjected to taxes. He noted that free shipping is the number one decision factor for online purchases, according to recent data published by ComScore. Retailers are also investing in speed by establishing store warehouses and centralized fulfillment centers, he reported, developing online inventory and proximity solutions. Retailers are betting on “click and collect” strategies, he said, with 57% in a recent survey saying it is a top omnichannel priority. There is significant investment needed to make it work, he noted, but it is core in their strategy as an antidote to show rooming, and a way to drive customers back to the brick and mortar store for pick-up. Retailers and ecommerce businesses also are investing in new delivery places, Buhler said, so “pure play” online or brick and mortar establishments are becoming more blended. The infinite processing capacity enabled by smart phones, networks and cloud computing are making new delivery models now possible, with new entrants into the market having entirely different cost structures. Features include sourcing spare capacity, rapid scale (up/down), technology enabled, and for now, focus on the last mile delivery. There is significant last mile investment being made in the marketplace, Buhler told the PV2020 group, with pricing going down everywhere at a rate of 1-2% globally but costs rising at about 2% per year. He said a lot of venture capital is going into this space, and new models are emerging such as crowd source shipping, storage, and local delivery. These services are focusing on better delivery, cheaper delivery, and more personalized customer experiences. Buhler said we are in the “singularity” phase of the Big Bang disruption in terms of delivery right now. None of the new models has been extremely successful…yet. But when we’ve seen these developments in other industries, it is only a matter of time before someone gets it right and then we will hit the Big Bang disruption. What makes delivery “better?” Faster delivery, new value added services, and convenience for the customer is king, Buhler said. He noted that estimated last mile delivery costs for the USPS are $3.20, but it’s $2.00 for Uber, $1.50 for LaserShip and $0.70 for drone delivery. What is more personal? When the customer wants it, where they want it, a completely transparent process, fully within the customer’s control. What is coming next? No idea, but Accenture’s research says there is a lot to worry about in this space for existing shipping providers, Buhler said. How Does Shipping Factor in to Consumer eCommerce Decisions? Cooper Smith, senior analyst for BI Intelligence, Business Insider’s industry research service, told PostalVision 2020 attendees that according to their research, shipping-related factors are the number one reason online shoppers abandon a shopping cart. He said that of the approximately $4 trillion each year in abandoned shopping carts, about 60% is recoverable. The top reasons for abandoning shopping carts, according to BI’s research, are shipping costs higher than expected, lack of free shipping, not being able to determine shipping costs earlier in the check out process, and estimated shipping time too long. Customers say they would shop more online if given more shipping flexibility (faster, cheaper), but online retailers aren’t offering consumers the shipping flexibility they want. Smith noted that Amazon offers 5 different shipping options, but many others do not. Shipping does not need to be a major cost center for retailers, he said, noting that Amazon is not just a direct retailer, it also is acting as a fulfillment operations company with its FBA program which helps offset traditional shipping costs. He said the number of third party sellers using Amazon FBA grew by 60% because 40% of the items for sale on Amazon are offered from third party sellers. Smith said research shows that one of the fastest growing delivery options is in-store pickup. Same day delivery is one way that online retailers can provide a sense of instant gratification to customers, he noted, and it breaks down the last advantage of in-store vs. online. There are some actual cases supporting same day, he said, but not many. Retailers are conditioning customers to know they can get same day online, he said. Research shows that urban-dwelling affluent millennials are the top customers of same-day delivery, with a slight skew toward men. When drones do arrive as a delivery option, they most likely will be used to deliver inexpensive items, Smith said, such as books, clothing/apparel and pet items, according to research. Consumers surveyed do not trust drones as much for delivery of more expensive items such as luxury goods or consumer electronics. USPS Says it is Evolving Today to Meet Tomorrow’s Needs. USPS Vice President of New Products and Innovation Gary Reblin talked about ecommerce and postal trends and what the USPS is doing on that front. He said the USPS is evolving today to meet tomorrow’s needs, and it is important to talk about 2020 now in terms of the changes likely to come and the need to plan and adjust. He noted that the ecommerce growth forecast keeps increasing and it is already a $200 billion market today, growing at 5 times the rate of traditional retail and projected to be 15% of total retail sales (today it is about 8%). More nimble warehousing solutions are on the rise, Reblin said, noting that click and deliver is being driven by retailers who are realizing that in order to fight against pure ecommerce players, they have to use their physical footprint to their advantage so they are looking for ways they can interact with customers. Ship from store also is growing, he noted. Reblin said the USPS can marry the fact that it goes to every location every day and by enabling same day/next day delivery it could meld networks to offer solutions that are quicker and better for the end customer. Reblin said that by 2020 same day delivery will be more common because retailers will have to offer it in their portfolio of services. New entrants in the marketplace also are affecting consumer expectations. Shopping in 2020 may also be much different than today, he said, noting that eBay has opened a physical store in London where consumers can look and touch items then purchase them using QR codes, which offers a blend of ecommerce and brick and mortar. People want to touch and feel products, but then have them delivered to their home. Seamless transactions from hardcopy to digital are making mail a great ecommerce tool, Reblin told the PV2020 group. He said catalogs are already trending as a “new” old marketing tool, with research showing 31% of shoppers have a physical catalog with them when they make an online purchase. Mail is changing to meet the ecommerce world, he said, and the shipping environment also is changing. Consumer choice will drive how and who they want to deliver their package, he said, noting that one of the things the USPS is doing is developing more apps to give consumers the ability to control their delivery. MyUSPS.com already allows users to set delivery instructions to tell USPS carriers where they want packages delivered, he said, and that is just the beginning. Reblin said maybe we should be asking questions of consumers differently, like why they might want something delivered to a parcel locker – what is the problem driving that preference. The real question may not be whether they want a locker, but that they want something changed and we need to figure out what that is. Consumer expectations continue to evolve, Reblin said, with demands for faster shipping and simple returns. According to Walker Sands’ 2014 Future of Retail Study, he said, 66% want 1-day delivery and 64% want free returns and exchanges. How can we blend systems to offer consumers solutions they need? Today 92% of retail purchases still happen offline, he noted, with 6.5% of consumers preferring offline shopping due to easier/cheaper returns. The USPS is working on solutions to make returns easier, he noted, including new tools, round trip labels, pay on scan by sorters, weigh on the fly, and more. What more will the USPS deliver? Reblin said groceries is just one possibility being explored. He said the USPS has a lot of interest in expanding its delivery offerings, but also is looking at what new markets are emerging and where it can go in those markets. New Consumer Research on Delivery. Matt Swain, Director, InfoTrends, briefed PV2020 attendees on the results of market research performed for the USPS OIG last year on the future of delivery and what customers want. Re-capping the results of its research presented at the 2014 PostalVision conference, Swain noted 7 key research findings: the majority of respondents did not realize the USPS is self-funded, most value the USPS as a community asset, reducing hours of operation should not be the primary focus for USPS cost savings, residential delivery location and number of days represented the most likely areas for compromise, some saw value in the USPS introducing new products/services at post offices, most participants were hesitant about the USPS providing digital services, and nearly all participants said they would be negatively affected if the USPS ceased to exist but had trouble articulating how they would be affected. Following up on the finding that residential delivery location and the number of delivery days represented the most likely areas of compromise, the OIG and InfoTrends pursued new consumer research, including insight around the cluster box issues. The research was conducted between August and September 2014, and included 5000 respondents surveyed online and by phone. Swain noted that 88% of the respondents had internet access at home. Swain provided a preview of the survey results, which he noted will be published by the OIG in a report later this year. The data from the research concerning where consumers receive their mail generally aligns with the USPS data, Swain said, in terms of curbside vs door delivery. When asked where they receive packages, 83% said at the door and 17% said other, with 6% at a parcel locker at an outside cluster box. When asked if they considered packages to be safe where delivered, 89% said yes (94% of Post Office Box customers said yes) and 11% said no. Overall, 94% of respondents viewed their letter mail delivery locations as safe, Swain noted. When asked how they would rate the current level of service received from the USPS, 73% said they were satisfied, 13% said they were unsatisfied and 14% were indifferent. Among respondents who viewed the delivery location of their packages as unsafe, only 59% were satisfied, Swain reported. When asked how they would feel if their delivery were moved to a locked cluster box, 17% said they would be pleased, 20% were indifferent and 63% said they would be displeased. The highest “pleased” response came from respondents with a door slot at home, no internet access at home, or POBox respondents. As a follow-up to the research study, the OIG held a roundtable discussion in September facilitated by InfoTrends, concerning modes of delivery and the USPS brand. Key themes that emerged from the discussion included that the USPS could learn from international implementations for cluster box delivery (e.g., what worked and where messaging/approach needed to be adjusted); some people raised concerns about reducing Postal employee interaction with consumers and thus reducing the USPS competitive advantage; and community cluster boxes will need to be designed to accommodate for the age of eCommerce, with an expectation for more (larger) parcels being delivered. Individual speakers’ presentation slides may be viewed here and Google Hangout full conference video here.